Team up with Woody, Buzz, Sulley, Nemo, Flik and Mr. 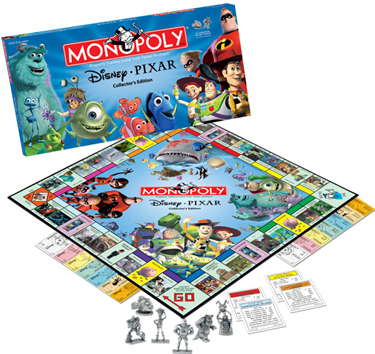 Incredible to bring the animated worlds of Toy Story and five other Disney presentations of Pixar films to life in the worldâ€™s most famous board game, MONOPOLY! Traditional MONOPOLY properties are transformed into famous locations from all six films including Toy Story, A Bugâ€™s Life, Toy Story 2, Monsters, Inc., Finding Nemo and The Incredibles. Buy, sell and trade Alâ€™s Toy Barn, Sulley & Mikeâ€™s Apartment, Edna Modeâ€™s Mansion, and many more magical, memorable locations as you relive the stories that continue to touch hearts and dazzle eyes around the world. All components, including 6 collectible pewter tokens, are completely customized. A must-have for Disneyâ€¢Pixar fans.